I've harped on about Matty's irritating decisions when it comes to dealing with the Ghostbusters property, their fans, and everything they do in general, but occasionally the negativity just isn't earnt and they hit a homerun with one of their toys. Today's review isn't quite that praiseworthy, but it's definitely a step in the right direction. The opening to Ghostbusters is an absolute classic, with a librarian encountering a very well-known ghostly archetype haunting the shelves of the New York Public Library. Shortly afterwards our three heroes have their own encounter and are left fleeing in terror after the Grey Lady transforms into some kind of glowing horror ape, and good times are had by all. The Grey Lady is a common archetype in ghost mythology - one great example is that which supposedly haunts the infamous Willard Library in Evansville, Indiana, which even has its own site and webcam in which one might occasionally catch glimpses of their ghost. Everyone was pleased to hear the Ghostbusters line would include an action figure of the onscreen ghost, though the decision to make only the glowing horror ape instead of the normal floating lady ghost - or both - was a tad disappointing. Still, as outlined before, great ghosts make for awesome toys, and I had to have this one. Glowing Horror Ape is sculpted entirely from transluscent plastic with pink and white highlights. Her hair is entirely white and her teeth are a disgusting yellow, leading into a blackened maw identical to her empty eyes. 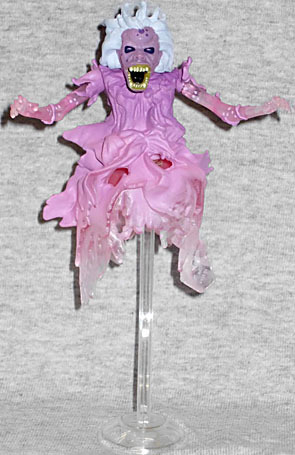 The main part of her body is painted with stronger pinks and purples than the rest of her, which become lighter further away from her midsection, with the bottom of her visage and end of her arms nearly completely transparent. The effect is great, complimenting a very good, very accurate sculpt. She even has articulation in the arms, at both shoulders and elbows, but neither are balljoints. No matter - she looks great floating in the air, something she does using the nifty ghostly stand that Slimer got and the Scoleri Brother should have had. Included with her is Scientist Egon, referred to here as "Ready to Believe You" Egon referencing the amusing ad from the film. As a child Egon was always my favourite character in both the films and the Real Ghostbusters cartoon series, so it's great to see him looking excellent here, in the scientist garb that suits him. His blue lab coat has an all-new sculpted and painted pocket-calculator, which is detailed very nicely, and he has the same great headsculpt and glasses as the other Egons in this line. Articulation is the same as all of the other Ghostbusters - he can do anything you want and more. Egon comes with three accessories - all PKE Meters with arms in different positions. These are neat, I guess, as now you can give extra PKE Meters to your other Ghostbusters, but it would have been much nicer to have seen these in an accessory pack with extra Proton Streams - the accessory you really want for your Ghostbusters. The "closed-arm" PKE Meter is also barely recognisable as a PKE Meter, so you'd rarely use that with anything. But considering Matty didn't really need to include anything else here, they're fine to have. Overall this is one of the MattyCollector's better offerings - for what they are, it's difficult to fault the two great figures you get in this pack. 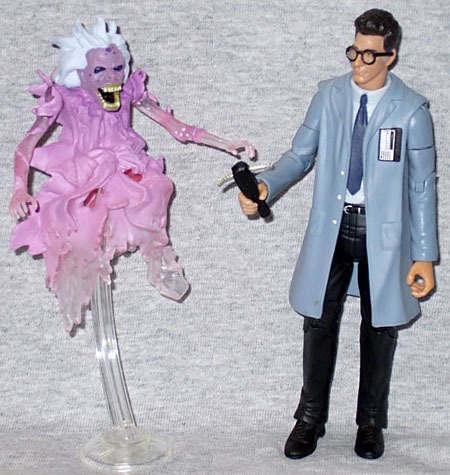 You might be disappointed that you will likely never have a regular Grey Lady action figure, and you might bemoan an unnecessary Ghostbuster variant, but Glowing Horror Ape is an awesome addition to your Ghostbuster figures and this Egon isn't nearly dispensible as spunked-Venkman. I give it thumbs up, and would love to see more ghosts in the line!